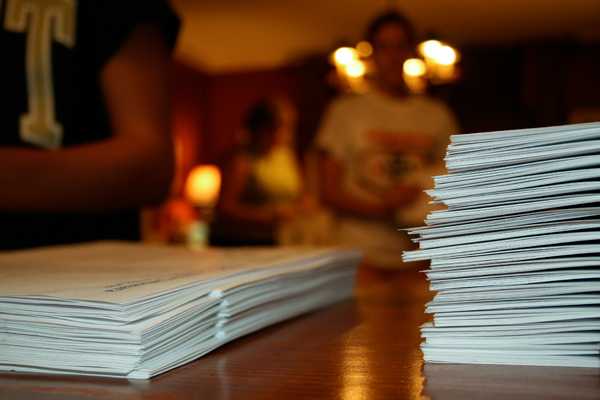 What takes 2,500 sheets of paper, 20 ink cartridges, eight sets of hands, and ten days to make? If you entered our blog giveaway a few months ago, you already know the answer: our wedding favors! The idea took shape during a conversation with my sister-in-law. She suggested we incorporate our passion for food and cooking into our wedding day. And since we’ve been blogging about our culinary adventures since 2007, we had a plethora of recipes to choose from. Thus the Family Cooking cookbook was born. We organized our recipes into the following categories: Hers (my family favorites), His (Nick’s family favorites), and Ours (recipes we’ve made together). We ended up with close to 60 recipes, and that was after thorough editing! 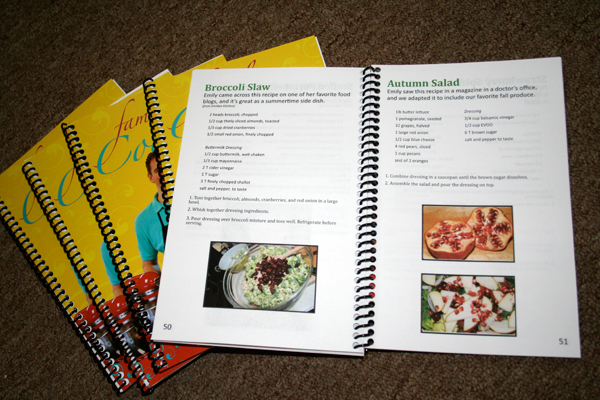 Once we had collected and organized the recipes and photos (all taken by us), I laid out the pages in Adobe Illustrator. 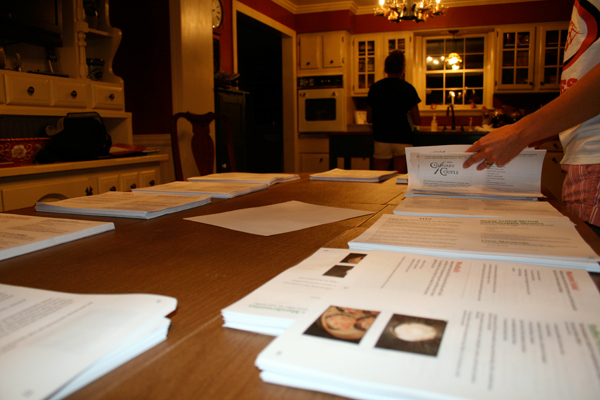 After the pages were printed, I toted them to my parents’ house for help with the assembly. It took four of us to properly stack all 125 books. And let me tell you, it was a relief when I dropped them off to be bound! In addition to having the books professionally bound, we also had the covers professionally printed, with help from a photographer friend and a graphic designer friend. Finally, sister-in-law once again volunteered to help wrap and label each book. 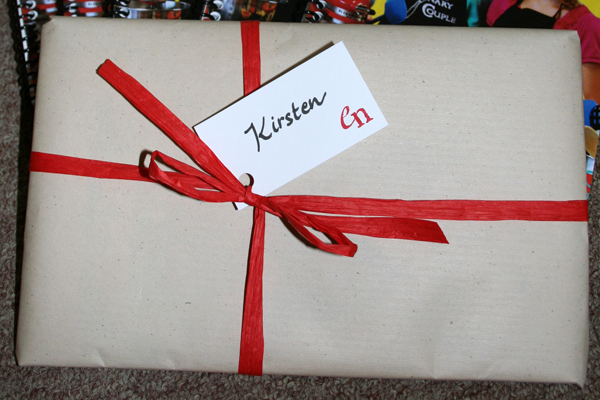 She wrapped the books in kraft paper, tied them with red raffia ribbon, and attached cardstock name tags with our monogram stamp. We were thrilled with the final product — both inside and out! We asked our day-of-coordinator to place each book on the appropriate table, and they were opened before we even entered the tent for the reception! 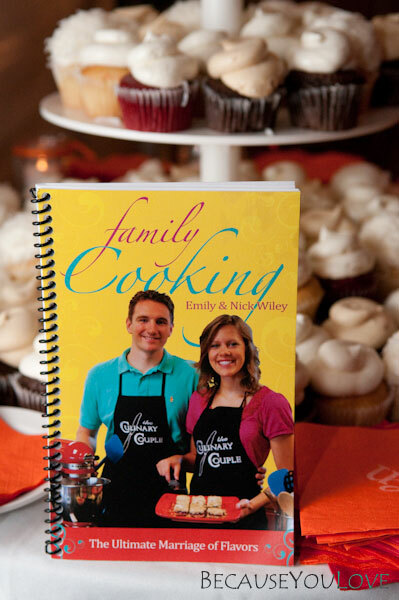 Now we love seeing the cookbook displayed in the kitchens of our friends and family members. 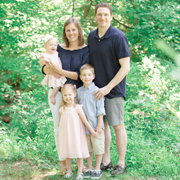 And we especially enjoy hearing about the recipes they’ve tried: Dad’s Fluffy French Toast, Uncle Lloyd’s Potato Salad, Aunt Jane’s Apple Dumplings. It’s something I know our guests will cherish forever. That is the best favor idea EVER! Now I’m jealous of all the guests at your wedding! Fantastic wedding favor idea! I love the cover … “Ultimate Marriage of Flavors”. You should sell these! I love this favor idea. I love that I have a copy of the cookbook 🙂 All your recaps make me excited for October! What an awesome favor! So cute.